I thought that when school got out that our schedule would of slowed down. But, for our family it seems the pace has remained the same. Even though the structure of school is gone (for now) we are still a busy family on-to-go. I still find myself as “taxi mom” taking them to Taekwondo classes, ballroom dance lessons, church camps, medical appointments, piano lessons, etc,. I would definitely have to say there is never a dull moment in my busy family’s lifestyle! I am definitely a mom on-the-go! And, who isn’t!?! As mama boss, I take great pride in caring for my tribe! I know that having the right kinds of snacks on hand is important. This kind of snack must satisfy the demands of my kids’ tastebuds and meet my expectation for nutritional goodness. 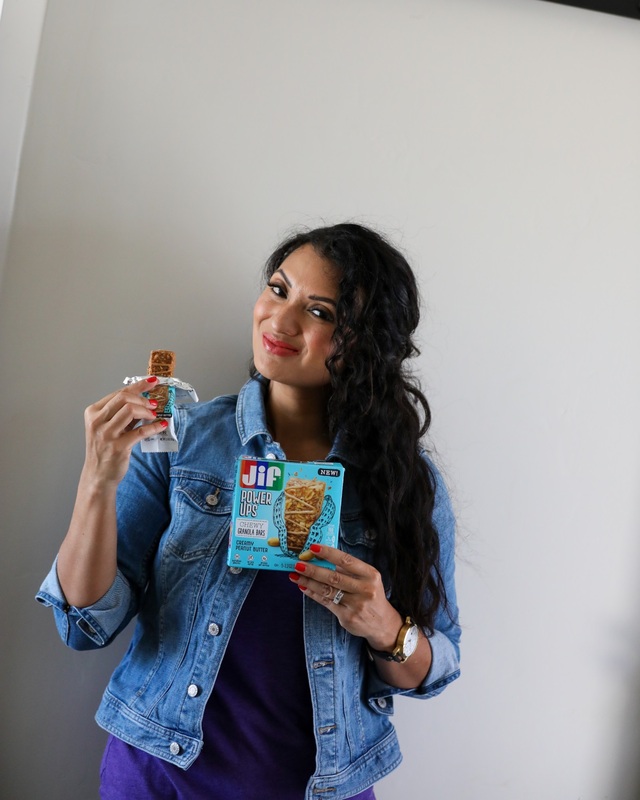 Jif® Power Ups™ Chewy Granola Bars and their Creamy Clusters from Target are the perfection snack for busy families and moms on-the-go. My son started Taekwondo last fall. We are thrilled to see him excelling in this sport. Elijah is quite an athletic and team player. I would like to think he got his athleticism from me! LOL! Being the third child, Elijah has had to tag along to his big sisters dance practices, lessons, and variety of activities for years! Albert and I knew it was time that we invested in his interest and we could also see he was ready for the commitment too. Elijah has Taekwondo lessons anywhere from 2 to 3 a week. It is amazing to watch him perform the variety of head-height kicks, jumping and spinning kicks, fast kicking techniques and exercise drills. When class is over he is absolutely hungry and the NEW Jif Power Ups at Target saves the day! His favorite snack is Jif Power Ups Creamy Peanut Butter Chewy Granola Bars. Peanuts are the #1 ingredient and Elijah and I are a total fan of peanuts. Because there is no corn syrup, I feel completely good about giving this snack to him. My two daughters Emi and Chloe love to dance! They have been dancing since they were walking. It has been beautiful to see them grow and evolve….and to discover what they are truly passionate about. My daughters both enjoy ballroom dancing and regularly compete and perform. This fall they will be attending a prestigious charter performing acts school they recently got accepted to. We are so proud of them. Ballroom dance is their passion. Dance moms know how busy a dancer’s life can be! This definitely impacts a family’s lifestyle for better and worse. It is crazy how many miles I have tacked on our family van driving them to lessons, coaching and practices. It is a pace you need to be at least one step ahead. With all this activity it is important that my girls have a portable snack to keep them fueled and happy. I am so grateful for Jif in providing the perfect snacking solution for my girls. They also love Jif Power Ups Chewy Granola Bars for its unique taste & texture. Okay, enough about the kids already. Let’s talk about me! If you were to ask me what I do in my free time, I would say “what free time?” There really isn’t any free time in my life and to be quite honest I don’t think I would want it any other way. I thrive on activity and motion. However, I need to remember to take care of myself and make the time to refuel throughout my busy day. I love that new Jif Power Ups at Target provide me with the energy in the middle of the day, or anytime for that matter. Our family is a total fan of Jif! Did you know that Jif is the #1 brand of peanut butter in the USA (based on IRI Sales? I invite you to head over to your local Target and try out the new Jif Power Ups yourself. Pack them for your summer trips or day excursions. They are the perfect lunchbox solutions for summer camps. And, without a doubt they are my favorite snack as I prep for Back to School. – Available in two flavors: Creamy Peanut Butter and Chocolate Flavored with Peanut Butter. – Good for any time of the day. – A perfect blend of unique taste and texture. – Available in Creamy Peanut Butter and Strawberry Peanut Butter. – Real creamy centers; balance of crunchy & chewy. – Ideal for afternoon and evening snacking. Take advantage of Target Cartwheel for Jif Power Ups running through 7/08/18 – 8/04/18. Receive 30% off any Jif Power Ups snack. My friends, I would stock up! 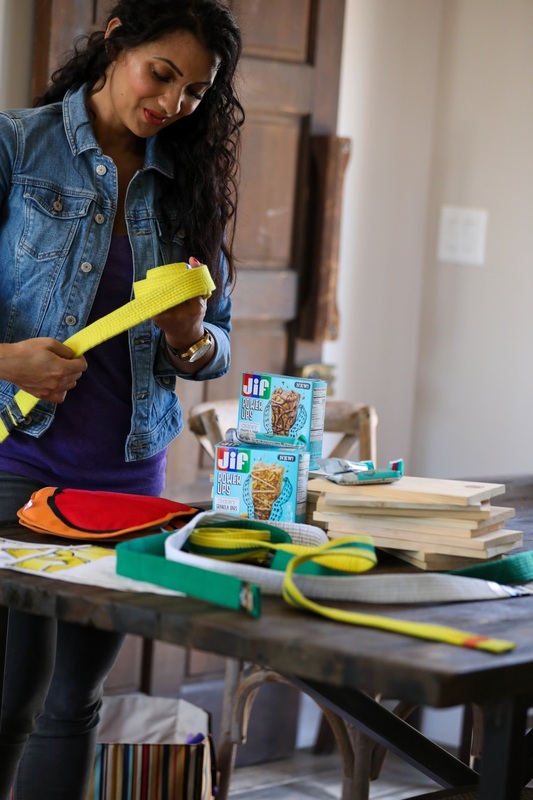 To learn more about the Jif brand follow them on Instagram and like them on Facebook. My outfit details: denim jacket, t-shirt, denim jeans, watch, shoes, sequin drawstring bag, and kids shoulder bag. These sound good! I eat a lot of granola bars and those types of things at work for snacks during the week- so I’ll have to check these out. Yum! Jif is the best peanut butter. I love granola bars as a better-for-you snack, so I’m definitely going to have to try these! These granola bars sound so good- I love Jif peanut butter! 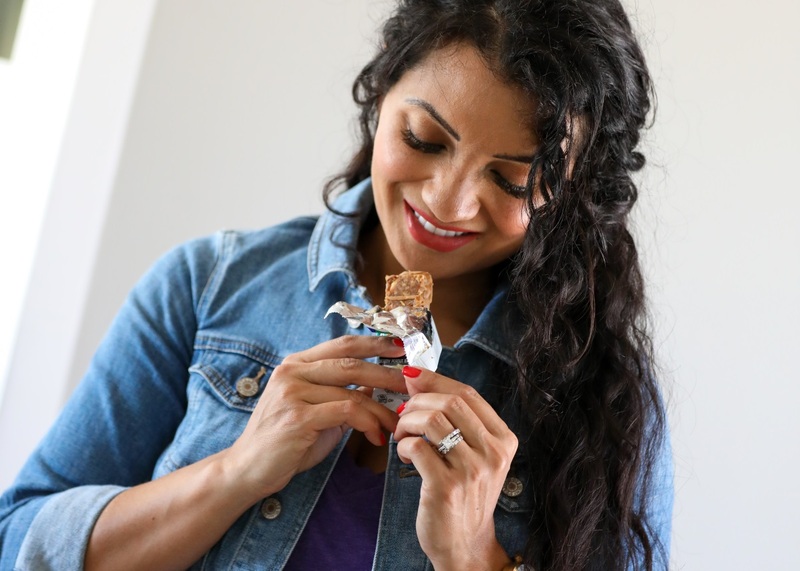 I love peanut butter – so these bars sound delicious. Thanks for sharing with us! These sound and look like the perfect, quick, afternoon snack. I’m always looking for new things to fill my cupboards with for the kids. That sounds like a good and perfect on the go snack for the whole family and it really looks so delicious. 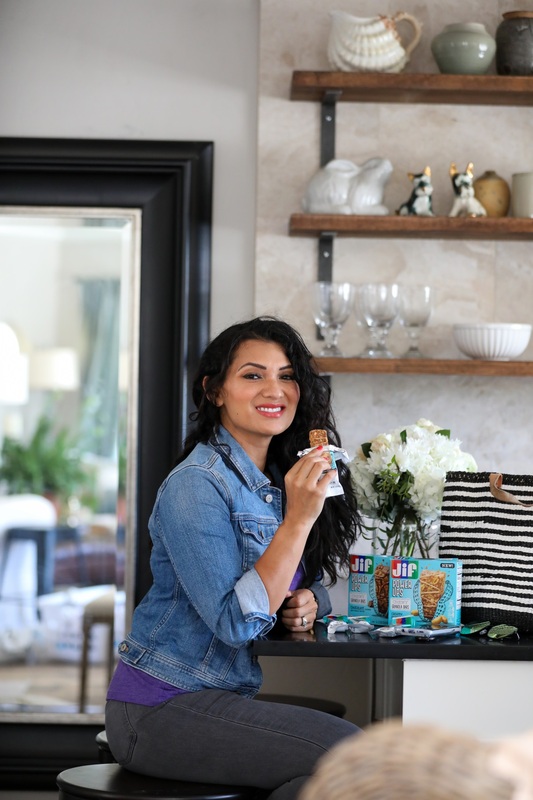 I have never tried this product but it looks like a good one, so delicious and it also looks like a perfect on the go snack for me. Sounds like a great on-the-go snack! I should look into getting this for when I get snacky at work! OMG these look soo good! What a great snack idea! i’ve never heard of those, but I love Jif, and those look so so yummy! What a great treat idea…this is perfect for back to school too! ooh these look lovely, I dont think they do them in the UK but if they did I would totally check them out for my kids lunches! Chewy granola bars are my favorite. Now considering these bars are made by the same people who make JIF peanut butter, I am positive that these bars will be an all time favorite in our home. Moms do so much and it’s really important that they’re energized and that they take care of themselves. I think it’s nice that there’s a snack like this to keep moms going and it’s also something that the kids will enjoy! Wow! This one’s a winner.I just love everything about this!My boys would both probably DIG this! I hadn’t heard of these before but like you, I am always on the go so they sound great. Really tasty looking too! These sound really good! My kids would love these! YUM! These all look delicious! Will have to try this! Snack is my favourite food. I never try this but it sounds very tasty. Love this! Wow, that sounds like a good snacks for me. I always love to have an on the go snack most especially during time that I am in a hurry going to my work. Your smile with blue denim jackets looks so much stylish. 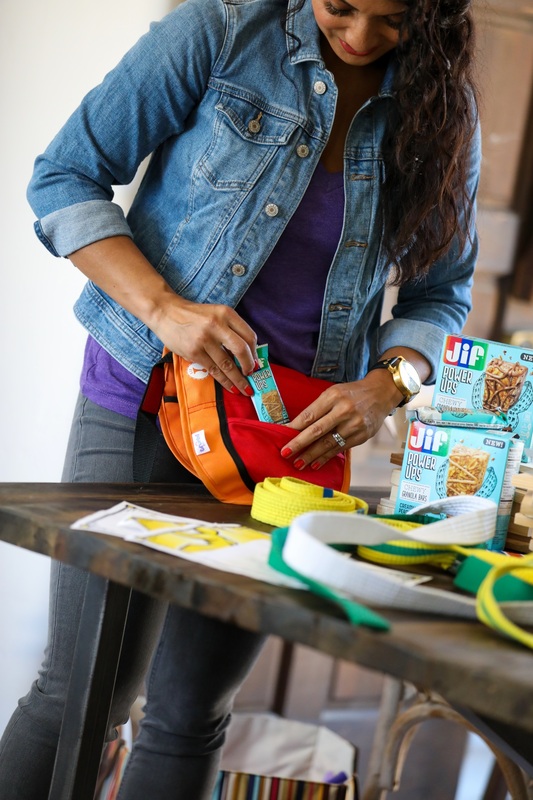 We love Jif peanut butter, so we’ll have to give these snacks a try! You look lovely as always Debbie! !